Sometimes it’s best if your (guest)users cannot download the files from a SharePoint Online site. And there’s some simple ways to prevent this. One of these is to use the Access Control options in the SharePoint admin-center. These can be used to control access to documents when using an unmanaged device. In this blog I want to go one step further. By using Microsoft Cloud App Security we can now use the power of Azure AD’s conditional access rules to prevent any download of documents. And in addition, these rules can apply to different cloud applications, not just SharePoint Online. Conditional Access App Control is part of Cloud App Security and is tightly integrated with Azure AD conditional access. When a user tries to access a resource on SharePoint Online, his/her identity is determined. When done, Azure AD checks if any conditions apply. A condition might be based on the device being used, the sign-in risk, or the location. It can also be based on the user or group (for example, external users or specific domain roles). Based on the conditions, Azure AD will apply a policy. Policies can be based on granting access with specific settings (the enforcement of MFA for example), blocking access or passing on the handling of the policy to another application. Cloud App Security App Control is such an application. This is called Conditional Access App Control (CAAC). When the policy has been passed, CAAC can monitor the connection, apply a custom (Cloud App Security) policy or block download of documents. That’s the one I’m going to use. According to Microsoft, this is to keep the user within the session, without requiring any install on the device. For this post I’ll be using Azure AD Premium 1 and Microsoft Cloud App Security. These are required for this function to work. One of the first steps is to configure the conditional access policy. I will forgo the detailed steps. But you should know that you’ll select the users, client apps (in this example Office 365 SharePoint Online) and conditions. But then you get to the Access controls. 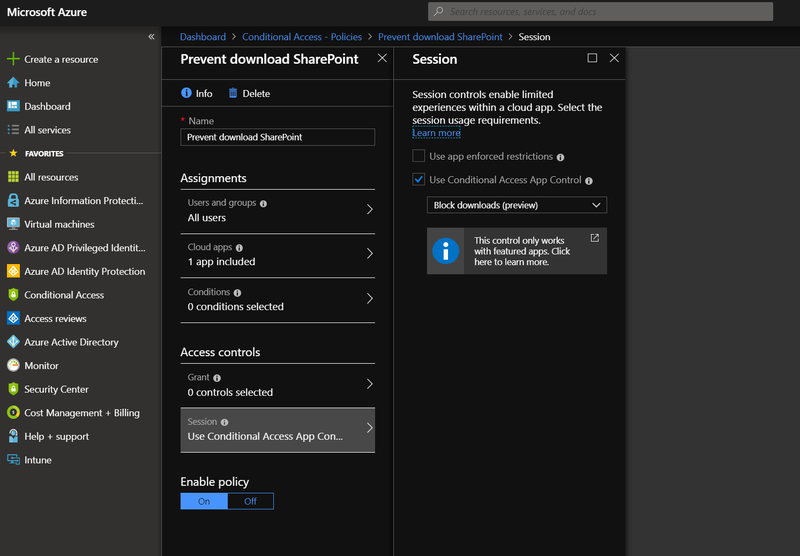 And here’s where you can configure the rule to use Conditional Access App Control. I’ve selected Block download (preview). After saving this policy, it will take a very short time to take effect. The first thing a user will notice is the dialog box. This tells our user that the session to/from SharePoint Online is monitored by Cloud App Security. When a user tries to download a document from a SharePoint site, Cloud App Security steps in. The user sees a dialog box detailing the action. This blog was to show you how a conditional access policy with app specific restrictions might work. But please note that this might not be the right solution for you! For one thing, preventing downloads from SharePoint Online does come with a big disadvantage: you can only use this solution for all site-collections. Also, there’s the licenses to consider. MCAS does not come cheap, although it is part of Microsoft 365 and EMS E3. But, then again, if you want a solution which is user-friendly and can manage more than just Office 365 cloud applications, this is the way to go. Also, blocking downloads is just on the functions. In addition, you can set alerts on these actions or get an insight into any trends. And, to be fair, you get a lot more conditional access options when using this function. I’m very looking forward working with the new sensitivity labels and conditional access. When available I’d like to compare this function with the one described in this article. So keep posted!